There are a million reasons not to wear a dress to a wedding (when the dress code permits! )—from making tipid because you can rewear pieces you already own, to shaking things up because you don't want to look like everyone else. As much as you don’t really care about getting “caught” wearing the same dress twice—or thrice!—we admit to kind of wanting a different look every time. Also note the fact that we can’t really escape the Instagram updates and photos that’ll be taken (for sure! ), thus immortalizing every wedding guest look we step out in. Take the dress code seriously and translate it into exactly three key pieces (no more, no less!). That way, with a skirt and top and another layer over, you don't look underdressed or OTT. Does the invite say neutrals or pastels? See Tricia G's very chic modern wedding guest rendition or Camille Co's unapologetically pastel ensemble for more inspo. These are honest to goodness, tried and tested, no-fail fashion formulas. Black and white? Works every time. A classic top tucked into a fancy skirt? It's flattering on most body types! A midi-length skirt, low heels, classic colors, and a fun statement bag—we think Sarah Lahbati's got it all right. Likewise, a structured skirt paired with a crisp white shirt (which we bet you already have!) as seen on Mari Jasmine proves to be just as spot on. The best part about this styling idea? After the wedding, you can wear your fancy top with your jeans, and wear your fancy pants with a t-shirt! Janine Gutierrez is pretty in pink in her ruffled top and high-waisted retro trousers. Can't get over her duck egg blue heels and '90s-inspired beaded purse! Meanwhile, Heart Evangelista is elegant as always, with her multi-tiered top (which can also be worn as a dress) and wide-legged pants. She looks extra sharp with her flawless beauty look and not-a-strand-out-of-place tight bun. Men can't have all the fun, right? Experience the ease and convenience of wearing a well-tailored suit at weddings. For best results, choose a designer who knows your body shape well and go for bolder, braver, and statement-making colors. 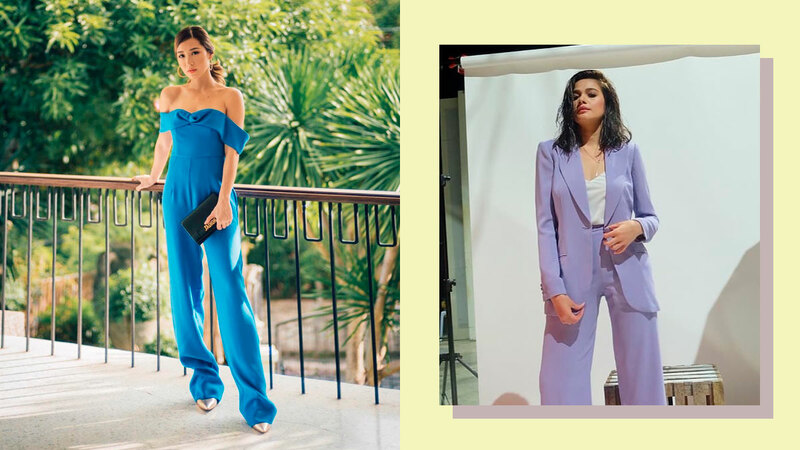 Wear the suit on its own like Glaiza De Castro, or with a cotton shirt underneath a la Bea Alonzo. This is probably the least recommended item in this list if your goal is to save, because you can only rewear it as much as you would rewear a dress. But if you're after the sleekness of a pantsuit silhouette, then, by all means, go for it. Choose an elegant fabric (one that falls or drapes well! ), a jewel-toned color, or a floral-print one. Check out Kryz Uy's blue, off-shoulder pantsuit and Kyline Alcantara's summer-inspired number.